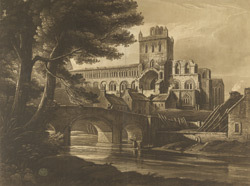 Jedburgh Abbey was founded by the Scottish King David I, in a location close to the Scottish boarder with Northumberland, to demonstrate his power and control of the southernmost part of his kingdom. Jedburgh Abbey was built in the Romanesque and early Gothic styles and the main church was built in the shape of a large cross with nave, presbytery and transepts, set on higher ground. The cloister, chapter house, cellars and other accommodation were built on lower levels and this means that the arches of the nave dominate this view of the abbey. At the end of the 16th century, the east range of the Abbey was demolished, and three new houses were built on the site. A manse and stables were later erected over the west range, and mills were built at the south-east corner of the cloister.